We have been in the Pacific Northwest since late October… not what we had originally planned (heading south right after the holidays) but being retired does not mean we are on a permanent vacation. We still have a “house” that needs repairs and maintenance (especially after it has been driven to Alaska and back). As "50 somethings" we have health concerns that need to be attended to. And sometimes family members have issues that come up. That said, we are so appreciative of how being retired allows us the flexibility to change plans, to take the time to do what needs to be done and to be available to help family when they need us. We have finally begun heading south but before we start having new adventures I decided to write about a previous one – our trip to Tanzania! In September 2007 we traveled to Tanzania on the REI Adventures Kilimanjaro Climb and Safari. 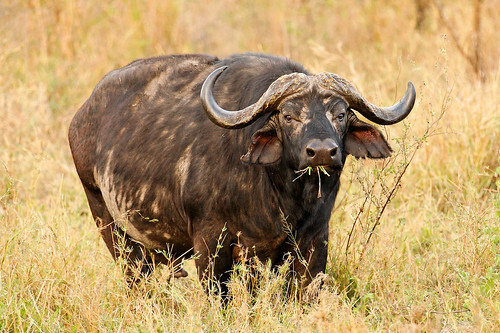 We spent 6 days in Kilimanjaro National Park followed by a week long safari to the Ngorongoro Conservation Area, Serengeti, and Lake Manyara National Parks. How do I describe the experience of climbing Mt Kilimanjaro? Some may not think the area is particularly scenic as it does lack the features that many of us love about mountains in western North America; jagged peaks, rushing streams, cascading waterfalls, turquoise alpine lakes and dark green conifer forests. 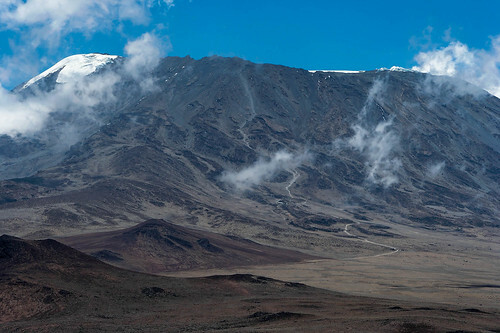 And the glacial summit on Kibo, the highest of Kilimanjaro’s 3 volcanoes, is frequently obscured by clouds. 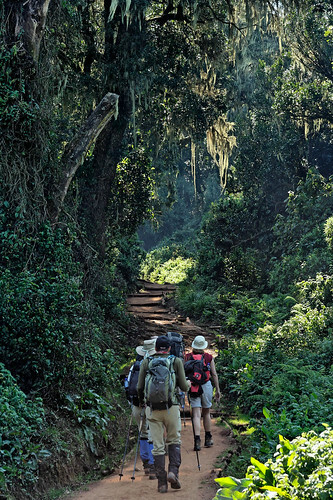 In addition the views inevitably include the sight of a continual stream of people traipsing up and down the trail especially on the popular Marangu route. It is definitely not a wilderness experience. …up to alpine desert and ending at the glacial summit. It could be the highest point in the world that someone without technical climbing ability can reach safely. 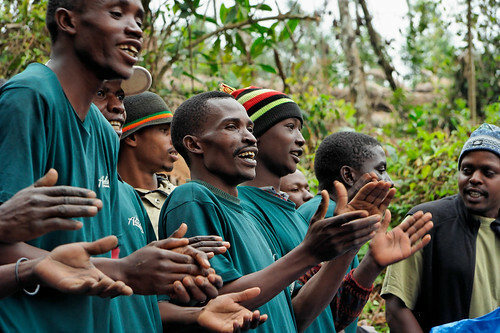 And there is a culture of support built in with the ready availability of guides, porters and shelter. The first 20 miles are relatively easy for those supported by porters carrying all food and gear. For someone in reasonably good shape the daily mileage is moderate and elevation gains modest. 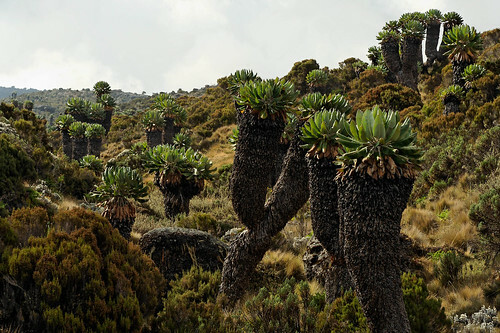 At higher elevations the biggest issue becomes the altitude but most tours allow a day for acclimatization, where one hikes up to a higher elevation and then descends to sleep at a lower altitude. For many this is enough to avoid most symptoms of Altitude Sickness. The last 5 miles to Uhuru, Kibo's summit, is where the real challenge is. 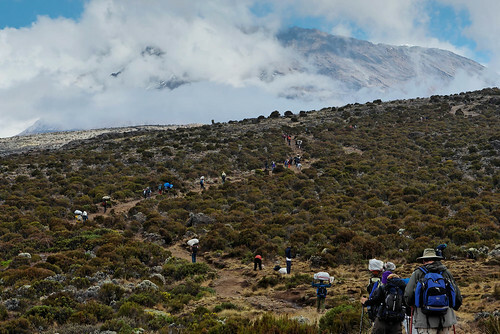 The trail up Kibo is just visible in the middle of the photo. Uhuru, Mt Kilimanjaro's true summit, can be seen at upper left. 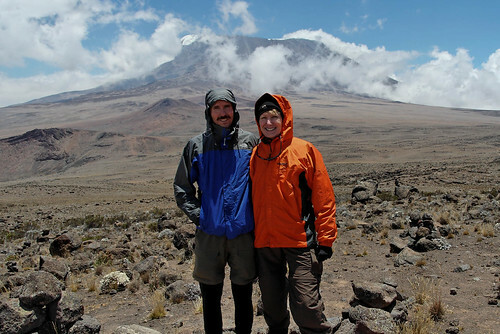 We arrived at Kibo hut (15,520’) in mid afternoon. After eating we tried to sleep for a few hours before being awakened at 10 PM to try to eat again. The final push for the summit begins before midnight, in bitter cold with countless switchbacks up steep scree for 3,820’ of elevation gain. Hiking with a headlamp creates its own “other worldly” sensation but it was magnified by the sight of lights from innumerable other headlamps snaking up the slope both above and below us. Very gradually the sky lightened and we arrived at Gilman’s Point (18,685’), in daylight, just in time to get a brief view into the crater before the clouds moved in. 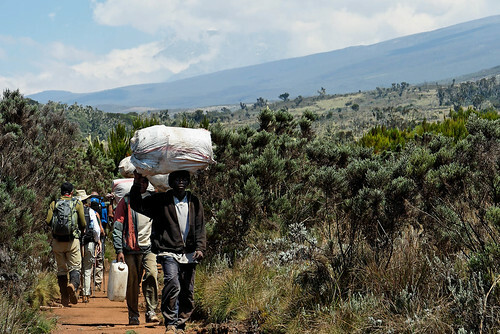 I believe much of Kilimanjaro’s appeal comes from the way it challenges the “average” person. At the beginning of the trip I was dismayed to learn that John and I were the 2 oldest individuals in our group. John was more fit than I was and my fear was that I would always be bringing up the rear. However I had been holding my own and, while the others rested at Gilman’s Point, John and I continued on toward the summit right behind Kevin, the most physically fit in our group. Then John decided to wait for Peter, our guide, who was carrying his pack in order to retrieve his camera. So I kept trudging along behind Kevin…until he began feeling sick and stepped off the trail. I was shocked to find myself alone as I continued on. Just as I reached the summit (19,340’) the clouds broke and the sun shone on the glacier. The beauty of the light reflecting off the glacial ice (coupled with fatigue, sleep deprivation and hypoxia) caused me to burst into tears…which promptly froze on my eyelashes (an interesting sensation that I don’t care to repeat). I believe reaching the summit was a bigger deal for me than it was for John. He had completed the Seattle Mountaineers Beginning and Intermediate Climbing courses and has many challenging and technical ascents under his belt. But I lack his experience and self confidence and have felt like such a “wuss” in the backcountry compared to him. 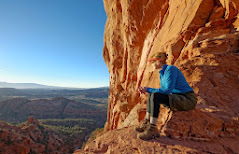 But reaching the summit proved to me that I’m tougher than I think I am and reaching it before anyone else in our group taught me that I don’t have to define myself by my age. 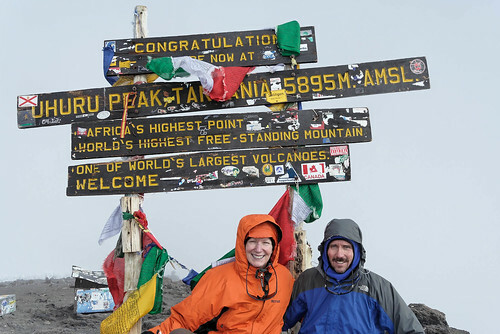 Kilimanjaro is an iconic mountain and reaching the summit earns one some “bragging rights”. I’ve discovered how easy it can be to just slip it into conversations with much younger backpackers. 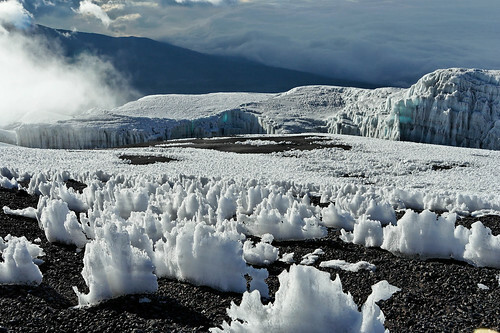 All of our Mt Kilimanjaro photos are on Flickr. After the focused energy of the climb the following week of being driven around looking at wild animals was very relaxing. Our group first visited the Ngorongoro Conservation Area before going to Serengeti National Park and later visiting Lake Manyara National Park. In addition, prior to our Kilimanjaro climb, John and I took a short walking/driving tour of Arusha National Park. As a kid I fantasized about driving across the Serengeti in a jeep wearing khakis so this was very nearly a dream come true. The reality was that we were in just one of many Land Cruisers speeding along dusty rutted roads, congregating near any animal sighting. 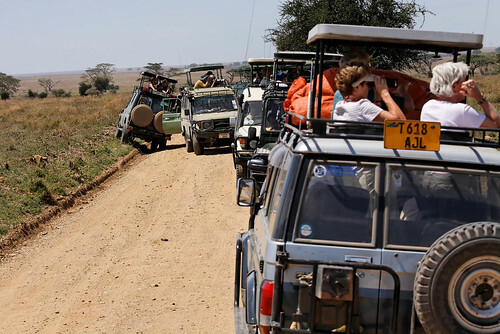 It is inevitable that anywhere tourists have come to view wildlife there will be traffic jams and the Serengeti is no exception. 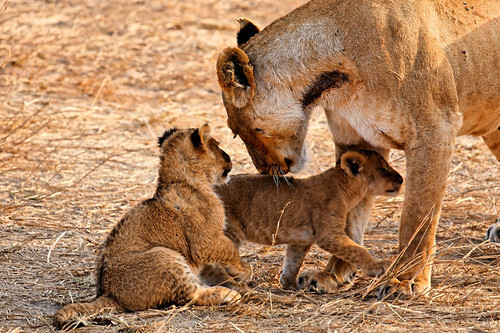 …as the previous evening we had been extremely lucky and had the opportunity to see 3 lionesses with six cubs up close…almost too close for comfort. I’ve enjoyed going to zoos but it just can’t compare with the experience of seeing animals in the wild. And in fact it is possible to actually get closer to animals in the wild than those in a zoo. These animals aren’t pampered, protected and dependent. They are involved in life and death struggles on a daily basis and they show it. They carry gashes from recent battles as this lioness did as well as the scars of many past skirmishes. 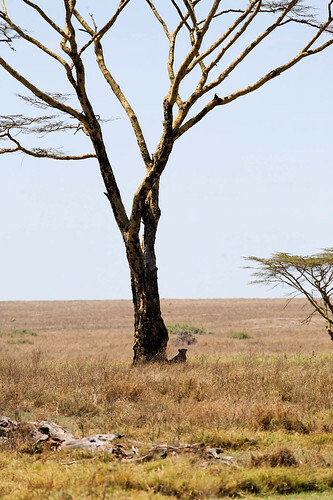 All of our Safari photos are on Flickr as well as photos of other sights we saw while traveling through Tanzania. I’ve never been part of what in our society could be called the “privileged class”. If anything the jobs I’ve held; first as a waitress, then as a retail sales clerk and later as a Registered Nurse, would have placed me in what might be called the “serving class”. So I have no real experience about how the “other half” lives and I have to admit that I have held negative opinions about the rich and powerful. I know that some of these opinions are based on Hollywood stereotypes and the covers of tabloids. However I have come to realize that I have based most of my opinions on a single encounter I had with a man many years ago. As a teenager I worked night shift at a hamburger restaurant in Louisville KY. Each night around 2 AM we’d get a rush of people after the local bars closed. One night a well dressed middle aged fellow with an obviously much younger woman sat down at one of my tables. When I asked to take their order she said rather wistfully “I’d really like something with tuna”. I pointed out that we didn’t have anything with tuna, what we did have was listed on the menu. She seemed resigned but he looked up at me and said “But you can go get a can of tuna”. I decided right away I didn’t like this guy, I didn’t like his demeanor and I really didn’t like his tone of voice. It made me feel surly. “No, I can’t” I replied as politely as I could given my attitude, “I don’t know where you can get a can of tuna”. Fortunately she quickly found something on the menu, ordered it and he backed off (maybe he sensed what I was thinking of doing with his glass of ice water). I come from a large economically challenged family and I couldn’t imagine what it would be like to expect other people to cater to my every demand. However, this all changed when we went to Africa. 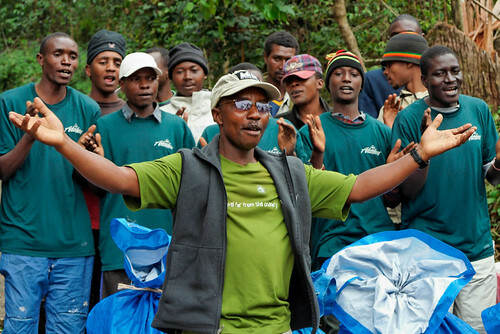 When we went to Tanzania on the REI Adventures Kilimanjaro Climb and Safari described above we were part of a well organized group and were well cared for from the moment we arrived. The only glitch occurred when John’s duffel with most of his clothing and gear took the “scenic route” and didn’t arrive in Tanzania with us. Just prior to our starting up Kilimanjaro Peter, our guide, received a call that John’s duffel had turned up. We were relieved but, as we had already scrounged enough clothing and gear to enable him to do the climb safely, he didn’t really need anything out of it. So when Peter asked if it was okay if it was kept at the lodge until our return John of course said that would be fine. It seemed like a funny question because why wouldn’t it be okay with us? How could we expect it to be brought to him? But then John jokingly said to Peter that he wanted it to be brought to Mandara Hut, our destination for the day. Another American would have known he was being sarcastic and would have replied with equal sarcasm “Yeah, right” or “Give me a break”. Another American might have impatiently informed him that it was impossible and perhaps proceed to point out the obvious; that his duffel was a long ways a way and a car and driver would need to be hired to get it there and then a porter would need to be hired to carry it for the next 6 days. However Peter, who didn’t recognize this as kidding and apparently didn’t understand typical American sarcasm, looked at him for a moment before calmly and politely replying “I need to make another call”. Recognizing his mistake John quickly tried to assure Peter that he was only kidding but he was not convinced. It was not until John insisted it would be a burden to him if his duffel was brought to him, that he would be angry if it was that Peter relented. We realized then how committed Peter was to catering to us and we quickly learned we must be careful how we said things to him. Unfortunately other Americans in our group had to learn this lesson the hard way as well. … except for one fellow I noticed who didn’t sing at all. A young woman in our group, who possessed a biting sense of humor, noticed him as well. After they were done she approached Peter and jokingly asked him why that one guy on the back row didn’t sing. Peter looked at her very seriously and asked her “What is his name? Can you point him out to me?” Just as John had done she quickly tried to assure him that she was only kidding (and fortunately she didn’t point him out). We later learned that Peter holds the men he hires to high standards and any complaint by a client will result in that individual not being hired for 2 months. After that he will be given a 2nd chance but one more complaint and he will not be rehired. Personally I was very uncomfortable with having that kind of power over another human being’s livelihood. Over the next 6 days our porters extended impeccable service toward all of us. First thing in the morning we were awakened with “Knock Knock” where porters entered our hut and served us hot tea in bed. Once we were up a basin of hot water appeared on our front steps. Hot meals were provided 3 times a day, even at mid day while on the trail, on meticulously set tables complete with table cloths. When we finished a particular dish then someone was right there to offer more. If we looked around, perhaps to locate the thermos of tea, someone was right there offering to help locate it. Once we were done eating dirty plates were whisked away. After supper we were even provided with a hot water bottle to take the chill off our sleeping bags. Once we were underway a porter was always available to carry our day packs. Once we reached our destination for the day a porter would bring our duffel to our hut. After trekking on a particularly dusty trail our boots and gaiters were taken outside and the dust brushed off. 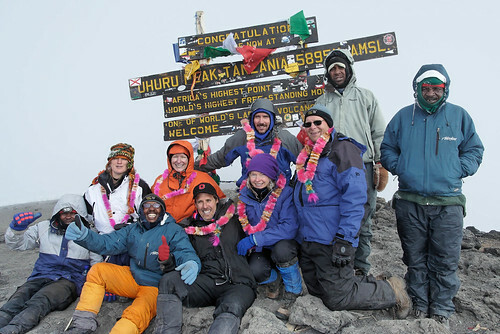 However the greatest level of service came when we made the final push for the summit. We set out about 11:30 PM in bitter cold. Several porters accompanied us; carrying our packs, watching our every step, attentive to our every need. During rest breaks, so we didn’t have to remove our warm bulky mittens, they opened our water bottles and held them to our lips. I have never felt so pampered in all my life! We couldn’t have done it without them! I am embarrassed to admit that at the time I didn’t pay close enough attention to know which porter took care of me. Granted it was dark and just putting one foot in front of the other required all of my attention. But still, I should have made the effort to find out which porter was holding my water bottle to my lips! I have since figured out it must have been Patrice and while we generously tipped all of our porters I now wish I had tipped him more. Not long ago I remembered the man who expected me to get a can of tuna for his girlfriend and it got me wondering, what would Peter have done in that same situation? Most likely he would have calmly and politely said something like “I need to make a call”. He would have tried to locate a grocery that was open at 2 AM, one that carried tuna and he would have found a way to get a can back to the restaurant. But I’m not Peter and I know that if I had to do it all over again I wouldn’t do anything any differently. I would still see this man’s “request” as unreasonable. I would still resent it and I certainly wouldn’t feel compelled to try to fulfill it. But then I had the luxury of knowing I wouldn’t lose my job because of this attitude. I know if I had told my manger about that guy wanting me to go out and get a can of tuna he would have said something like “Yeah, right”. However I like to think I did learn something from my experience on Kilimanjaro. I want to have a more attentive attitude towards those who serve me and I never want to take their efforts for granted. I’ve been lucky enough to have the opportunity to practice this on a regular basis as nearly every morning John serves me my morning tea in bed. It began right after he retired when I had foot surgery and he continued even once I was up and around. So I no longer wistfully wonder “Where’s my guy?” because he’s right there when I wake up with a cup of tea and a smile. I feel so pampered! And I am very appreciative…at least as appreciative as I can be first thing in the morning…and before I’ve had my tea. I loved this post -- especially the comment about Patrice helping you on summit day. 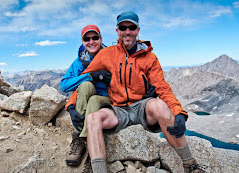 On July 30, 2005 Patrice was very instrumental in getting me to the summit. He is an absolute gem. I loved traveling with Peter Mato and you captured his undying service very well in your post.